Favorite Moment: Definitely the scene in the woods where Simon calms down Baz. This book was simply amazing. I was first introduced to these characters while reading Fangirl, and naturally, I had to read their complete story in Carry On. This story is a Harry Potter type world with two characters Simon and Baz (comparable to Harry and Draco). This book was filled with action, adventure, angst and, of course, romance. I will say it was a bit slow in the beginning, as it revolved around Simon’s angst (believe me, he has all the angst). However, once Baz appeared, the pace started to pick up. It might be because I absolutely adore Baz. The quest to find who killed Baz’s mother changed the dynamic between the two men and their relationship drastically changed. I don’t want to give away any spoilers, but I think it’s safe to say that fangirls would love this story. What I loved most about this book is the context that it was written in. This is a fiction novel based on a fiction story. We are essentially reading a fanfiction story, and my inner nerd was squealing. 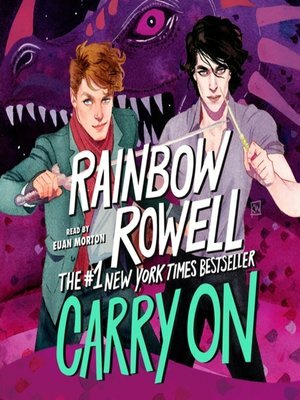 All I know is that I can’t wait to read all of Rainbow Rowell’s other books! I am using this book to check off “A young adult best seller” on the 2016 Book Challenge. Have you made any updates on this challenge?